Thirty degree swings in temperature can play merry havoc with my wardrobe choices. I get giddy with the possibilities that layering presents. To try and keep things simple, I opted for a neutral color palette. What the magazines would call a “color story.” So, here I am in mufti, in need of a haircut, more practice with my camera — which the children have finally relinquished — and a tripod. Not necessarily in that order. Tie: Brooks Bros. Maker’s|Shirt: Gitman Bros mini-tat|Sportcoat: J.S.Richards NY, Harris Tweed|PocketSquare: Silk Paisley Unknown|Sweater Vest: Ancient Greek, probably knit by a cousin|Khakis: J. Crew|Suede Chukkas: J. Crew. 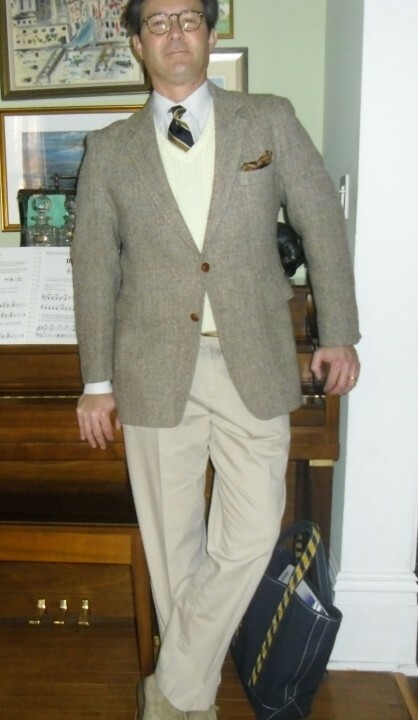 This entry was posted in Uncategorized and tagged brooks brothers, Gitman Brothers, Harris Tweed, J Crew, j.S.Richards NY. Bookmark the permalink.